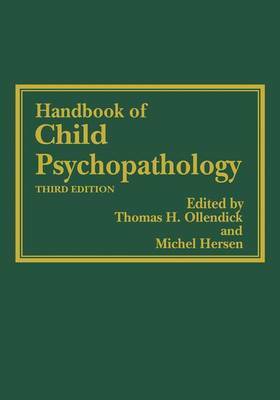 In our first edition of the Handbook in 1983, we the origins and course(s) of maladaptive behav- ior, whatever the causes, whatever the age of on- noted that child psychopathology should no longer be viewed as a downward extension of set, whatever the transformations in behavioral adult psychopathology. Rather, we suggested expression, and however complex the develop- that children should be viewed as children, not mental pattern may prove to be. It strives to inte- as miniature adults, and that a merger of the dis- grate these two disciplines in an intimate and of- ciplines of clinical child psychology and devel- tentimes complex manner. opmental psychology must occur for this evolu- Careful attention to issues of development and tion to be fully realized. In the second edition of other contextual issues relevant to children, ad- the Handbook in 1989, we asserted that the syn- olescents, and their families guided us in our ef- thesis of these two fields of inquiry was under- forts to solicit contributors for this third edition.